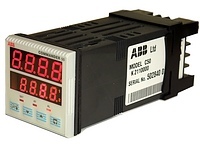 The ABB C50 Controller/Alarm unit is a compact single loop controller, with the capability to measure, indicate and control a variety of process variables. It is ideal for simple PID control, offering On/Off or Time Proportioning (PID) control with a one shot self-tune facility. The C50 can also act as an independent alarm unit, for example, as an over-temperature safety cutout unit for furnaces or ovens. The unit is quickly set up for most process signal inputs and, with IP65 (NEMA3) front panel protection, is suitable for a wide range of applications, including OEMs, consumer foods, ovens, HVAC and utilities (backup).